If you’re one of the 2000+ people to follow the facebook feed for Halsey Festival 2017 you’ll find a lot of activity with who’s performing, what will be happening, free things to do and great vendors to check out. We have a full rundown of what is to come to Halsey Festival this Thursday! You won’t want to miss any of it. Come hungry for a sampling of local businesses available for free and for sale. Halsey has changed a lot since last year… swing by to meet new businesses that have joined the block or are coming soon like Hahne & Co merchants: Kite & Key, Marcus B&P (owned by Marcus Samuelsson), City MD opening soon, Petco, Barnes & Noble and others like Sweet and Green, Ono Grinds Poke and Black Swan that recently opened. Get your copy of 100 Things of Newark signed by local glambassador and author, Lauren Craig. 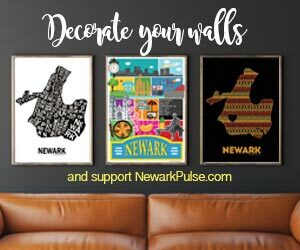 Check out these booths for coupons, freebies and swag: Wok to Walk, Kite & Key, Friends of Newark Public Library, Rutgers Alumni, NJPAC, Devils and many more! THANK YOU TO SPONSORS: The festival continues to grow and expand – this year thanks to the sponsors: Rutgers-Newark who leads the event and Prudential, Edison Properties, Hahne & Co, Teachers Village, Whole Foods- Newark, Barcade, CityMD, Newark Happening, and Barnes & Noble. Please note a lot of streets are closed and parking will be limited. Please take public transportation, walk, or bike. Above is the closure map for the festival. There are two Edison parking lots within the limits of the festival for paid parking. MORE INFO follow on facebook or visit the website. Use the Snapchat geo-filter on Thursday and use #halseyfest for a chance to win some cool prizes.